Summer Sweater for S (Bell-sleeved version of The Cherry Variations) | Curiousity? 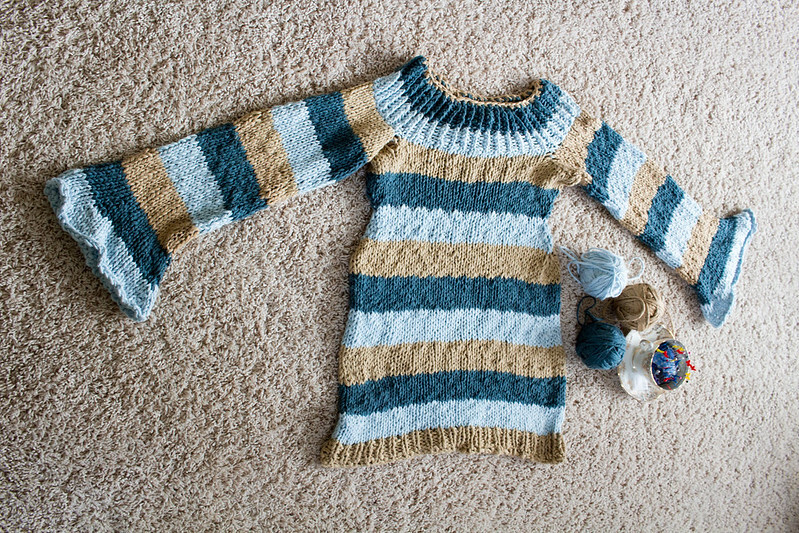 One of my personal goals for 2015 was to try knitting an adult-sized sweater. And I’m happy to say that I’ve managed it, although I admit I cheated a bit in making it for my sister rather than for myself, as she’s a few sizes smaller than I am. The yarn is KnitPicks Billow, which I picked up because my sister prefers things without animal fibers so that they won’t be bad for her boyfriend, who is allergic. It’s soft yarn and lovely feeling, but it’s a bit weird to work with because it has variable thickness. After a few test swatches, I decided it would be nicest in a simple stockinette that showcased the homespun feel of the yarn, since the other things I tried seemed to be fighting it. 1. Stripes. These are simple, 8 rows wide, 3 colours. When I got down to a bit before wrist length, I decided belled sleeves would be hilarious in this yarn because of the way it drapes. To do this, I divided the stitches into 3 (it wasn’t quite even but close), placed markers (since I was using 2 circulars at this point) and increased at the stitch markers every 3rd row, approximately, for the last two stripes (so last 16 rows). 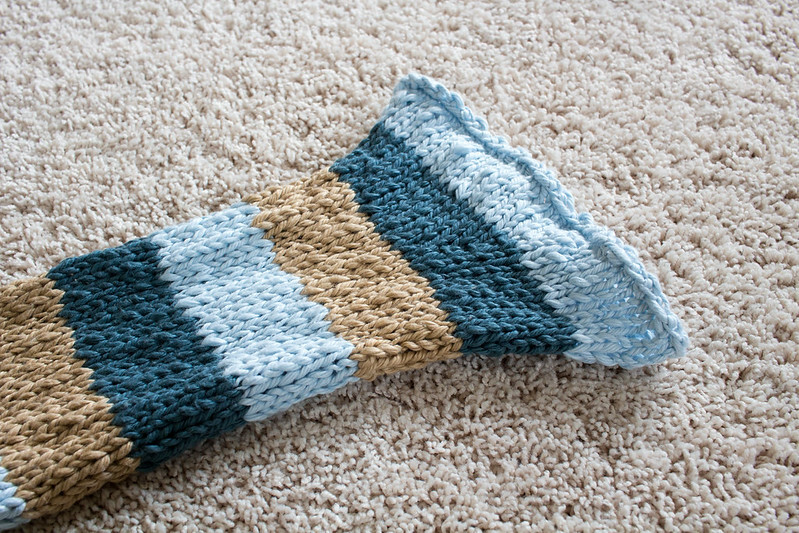 I cast off using some ludicrously stretchy bind-off from this page comparing bind-off methods. I think it was Jeny’s Surprisingly Stretchy Bind-Off. 3. The thing you might not notice immediately is that I decided to add a crochet border along the neckline. 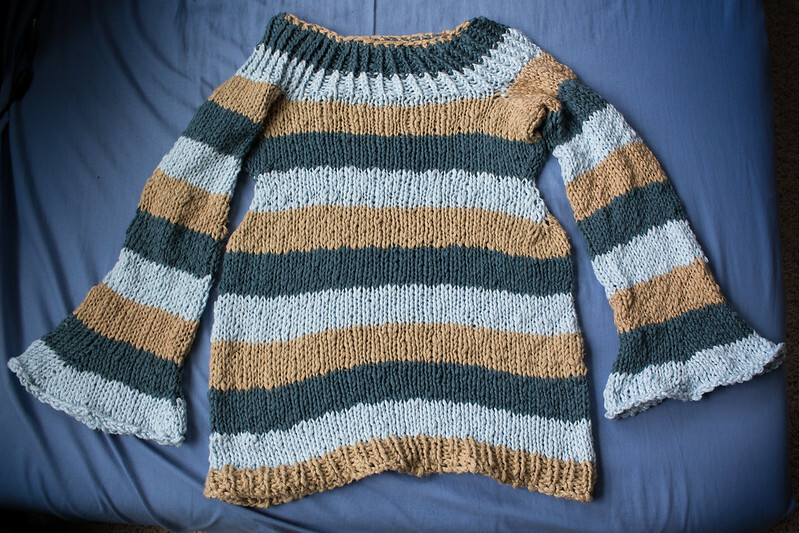 I found that the sweater as was tended to be a little too off-the-shoulder on me, and since my sister has much less wide shoulders, I figured that would be annoying and would eventually stretch it out to the point of uselessness. So I looked up stabilizing methods online and settled on a simple single crochet. I didn’t think to take a picture of myself wearing it, so no modeled shot. It would have just looked ill-fitted anyhow, as the shaping around the bust line was made with my sister’s approximate measurements in mind, so it was quite tight on my rib cage, let alone my bust. I don’t know how much she likes it, but it does fit, at least! 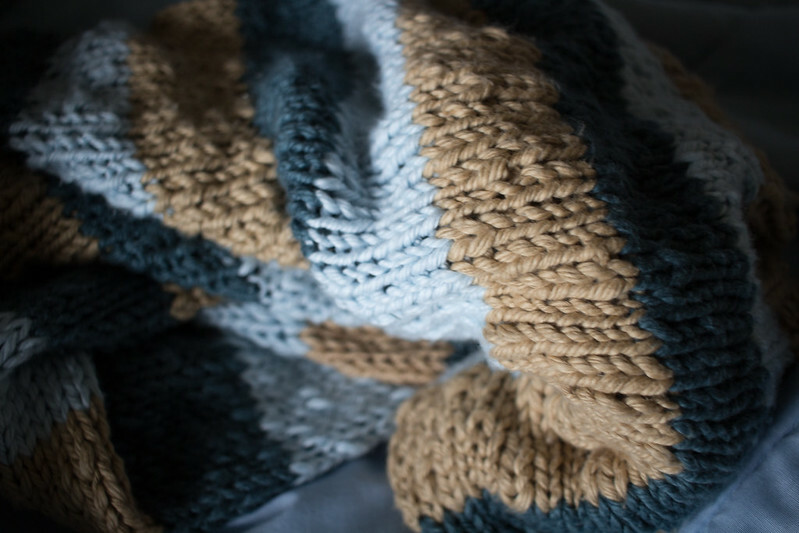 I kind of fell in love with the yarn as I was knitting it, and I like the pattern enough that I’m strongly considering making one for myself, even though it’s cotton and not exactly the most suitable for the Pacific Northwest’s soggy weather! 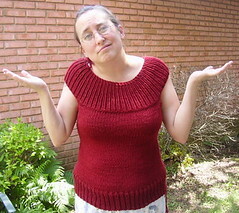 This entry was posted in gift, knitting, wearable. Bookmark the permalink.